This is branded as a lubricant and its a whole lot more. Honestly, where to start with this stuff is so difficult? I had not heard of this product until Adam at Mustang Maniac told be he was getting some trial cans in to test it out. He liked it so much he is now an agent for it. I saw the guys use it in the workshop down there, I tried it and I had of those OMG moments. This stuff is not the cheapest can out there granted, but what you do get is a nothing short of liquid miracle. Am I giving this to much of a hype? Hopefully by the time you read this you will agree with me. The lubricant; its very similar to the WD40 brand but this is a pastel pink in colour when sprayed onto a white cloth. I dries to leave no colour. Due to the fact that I have been unable to free some nuts and bolts in the past I have always craved something that was better than WD40, I found it and it was called Plus Gas. Yeah it was good and I liked that stuff, but sometimes even that wouldn’t get forty-seven year old rusted bolts out. Then I tried this stuff like I say, it seems to seek out the gaps and penetrate deep into the threads and it frees it up just like magic. Gibbs Brand is a revolutionary, patented product with many unique features. It works in all temperatures to clean and eliminate corrosion, to penetrate, waterproof, and to lubricate all metals and mechanical hardware. It’s even safe to use on many other materials including plastics and rubber. It leaves no sticky dirt attracting residue and can even be painted-over! (Gibbs) Contains No: Silicon’s, Waxes, Acids, Corrosives, Teflon, Graphite, Abrasives, Arsenic, Kerosene, Perfumes, Carcinogens or Synthetics. As soon as I used the product I wanted a can so I got some of Mustang Maniac while I was down there. My brand labelling is slightly different as it was the first batch for trial, but I have pictures of the proper branding here too. Same product just different labels. Pretty impressive claims it has to be said. 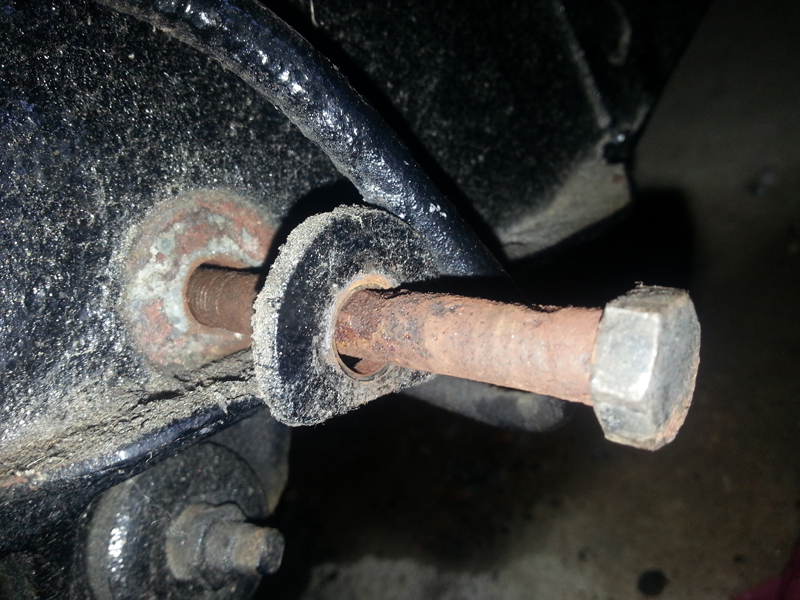 I have had some issue around stuck and corroded bolts under my car as you would expect. Plus Gas does OK, WD40 sort of does it’s job on the lighter nuts and bolts, but when I tried to remove the steering bracket next to the exhaust headers nothing was touching it. I squirted this stuff over it, waited and give it a short sharp tap the hammer to the bolt, put an old ring spanner on the nut and tapped the spanner to start the undo. The bolt cracked undone with the spanner. I applied the socket to the bolt head and worked the bolt back and forth, it just eased up after every movement. The bolt came out without damage, the nut was on the other side inside the chassis frame and difficult to get to. You can see how corroded the bolt was. Once it was removed I treated the nut and bolt and re-used them again. The nozzle is designed for use with a small pipe that is inserted into the end. The pressing of the nozzle controls how fast the liquid is squirted or you can just gently squeeze it to produce a drop or two onto a bolt thread. The times I have been sprayed trying to put a tiny amount on a thread just does my head in. A little application of the spray does go a fair way for soaking into the parts that need releasing. For cleaning you need a bit more and you could quite easily get carried away and just coat everything and go through the can cleaning everything. The other main thing with Gibbs is that its a protective coating too. There is a case of the “Bare Metal Car” which is getting some attention on the net, this is sourced from the Gibbs Website again. Built five years ago, driven thousands of miles and not a drop of rust! This beautiful 1930 Ford Model A Roadster Pickup hotrod was put together by Bryan McCann with some help from his father Scott, proprietor of Deluxe Speed Shop in Denver, Colorado, USA. It is an amazing piece of work, with virtually every piece either modified or completely hand-made. It’s a great testament to Bryan’s mechanical and metal-working skills – particularly as he was only seventeen when he started the project! The standard was so high that the pair decided to keep it unpainted. Now here is the amazing part; that was five years ago! Since then, the car has been driven thousands of miles to car events all over the United States. In fact we discovered it in June at the huge LA Roadster Show in Pomona California. We were admiring its superb bare-metal sheen and had to find out more. Imagine our delight when Scott told us that it had stayed rust-free all this time by treating it with GIBBS BRAND two or three times a year. He went on to say that they have used Gibbs on all their projects for many years. Don’t take our word for it – If you are lucky enough to see them – ask them for yourself! Now that is impressive; but it seems to work, I have sprayed this stuff on to all sorts, plastic, metal, rubber, vinyl etc and when water is applied to what ever coating it just beads off like a good wax on a paint job. When Gibbs is buffed off there is no evidence that it is on there. If you have something that is dirty and needs cleaning, spray this stuff on it, it works. Here are a few things I decided to spray just to show you what it can do. The use does not stop at the car, it can be used in the home, caravans, boats, industrial the list is endless. This an old punch I have had at the bottom of a tool box, I sprayed it with the Gibbs, got some white tissue and just wiped away the rust. This sun visor in my car is caked in dust and what ever else has lived there for 13 years. I sprayed it and the colour came back to black and looks like new. The last part is the glove box lid inside. I have spent literally a minute or so spraying the inside and wiping it down, no scrubbing, no elbow grease, just a wipe over. I could give it another go and make it look better, but this is a one wipe over scenario. You can see the first half I sprayed then the other half for comparison. For protection I have sprayed my chrome air filter, my chrome alternator, the wiper arms from the spindles, the hood hinges, the plenum cables, switches inside the car, door locks, boot locks, springs, everything I can in fact. On my other car (Toyota), I had waxed the paintwork and gone over some of the wiper plastic just under the windscreen. You know just how much of a pain that is to clean that off, even if you can. I sprayed Gibbs on it – Gone! The amazing thing about the product is that it can be painted over. Yep – you read that right, you can paint over the stuff. Now can you do that with WD40 or any other spray lubricant? No, as it leaves a residue or oily coating the paint will not stick to the residue. All sprays that I know of advise to degrease the surface first before spraying. Clean UPVC window frames and doors to maintain their colour and make them resistant to weathering. It will also lubricate and protect their locks and hinges – particularly useful in the salt-laden air of coastal areas. Start stubborn petrol lawn-mowers / strimmers etc by using Gibbs as an ‘easy-start’ fluid – even safe on 2-strokes. Clean and protect barbeques etc particularly during over-winter storage. NOTE: Make sure all power tools are disconnected first though – for safety sake! Incredible, for the want of a better word. To free up something – it works. To make something water repellent – It works. To coat something – It works. The results are in the pictures above as the process speaks for itself. Everything I have used this on, it has delivered on its promises. The hype is worth it. Yeah it’s a little pricey but it goes a long way. I would rather pay a little more for something that works rather than smash my knuckles up or round bolt heads off. Dead easy to rate this one, I could give it an 11 but that just looks stupid when people do that. But I honestly can’t recommend this stuff enough. I do not get commission, I do not get paid and I am not on a retainer from anybody that I review. I use this all the time and there will never be a moment when I do not have a can of this stuff on my shelf in the man cave. It’s a simple as that. I am difficult to please when it comes to ratings, I have given a few 10’s out, and I have given some poor marks to products I have paid £40 or more for, I have so wanted it to work, but they didn’t. My idea is that if it works, does what it says then it should get high marks. Giving to many full marks people wont take your reviews seriously. Marking things down just to create a variable result is not fair to the product. But I have been lucky to use some real quality stuff recently. The fact that Mustang Maniac now use this as a default for cleaning wheels before delivery, spraying a protective coating on chrome, wiping down vinyl, polishing HT leads, spraying a coating on distributer caps etc. That has to say something that they have gone from a trial to being stockists! Would I buy it again? absolutely no question about it at all, yes – it will always be on my shelf. Would I recommend it? That’s what I am trying to do here, go and buy some to try it. The only thing I would say about this is that I would like to see various sized cans like the WD40 range. That way people would buy a smaller can to try it out, rather than pay a decent amount of money for a large can. Yes it will keep, yes it can be used for other things, but the psychological barrier of paying out that sort of money is still there. Order some to try it out, if you speak to Adam let him know where you read the review from.